Grüß Gott! Congratulations to everyone who participated in the Einzel- and Gruppenpreisplatteln. 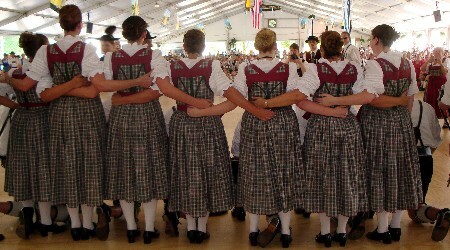 We had 83 couples competing in the Einzelpreisplattler this year and 16 Vereine in the Gruppenpreisplattler. The standings in the Einzelpreisplatteln that were originally posted have been revised because I have disqualified myself and my partner from the Einzelpreisplattln. As a result, in the 50-59 age group, Bob and Jutta Hugel have been moved up to 2nd place and Toni Auer and Kathy Bruni have been awarded 3rd place. Please direct any questions pertaining to this decision to me. Click below for results.